SilverStone’s latest prestigious case breaks the established mould of case design by rotating the motherboard tray to hold your expansion cards vertically. 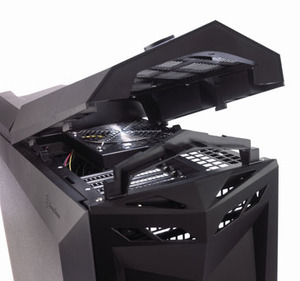 The cooler of your graphics card is therefore pointed directly up at the roof exhaust. 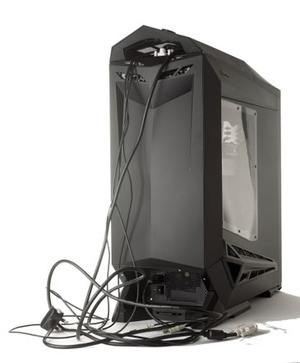 This seems the most logical orientation for a high-end PC, as cold air can be sucked in through the floor and passed up (aided by fans and thermodynamics) to be exhausted out of the top. Given the originality and innovation in this design, it’s curious that SilverStone has chosen to name it after a big, brutal-looking bird. Earth has known ravens for millions of years, and the species has barely evolved in that time – you could almost call the bird Neanderthal in its physiology, something not true of the Raven case. 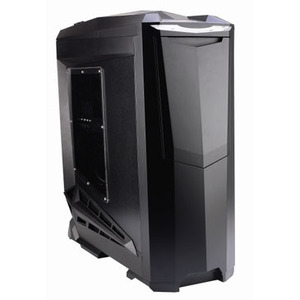 The case looks quite cool in an aggressive, brutal kind of way and as far as we can tell, it borrows more from the bird than from a series of heroic fantasy novels by James Barclay or a certain Edgar Allen Poe verse. 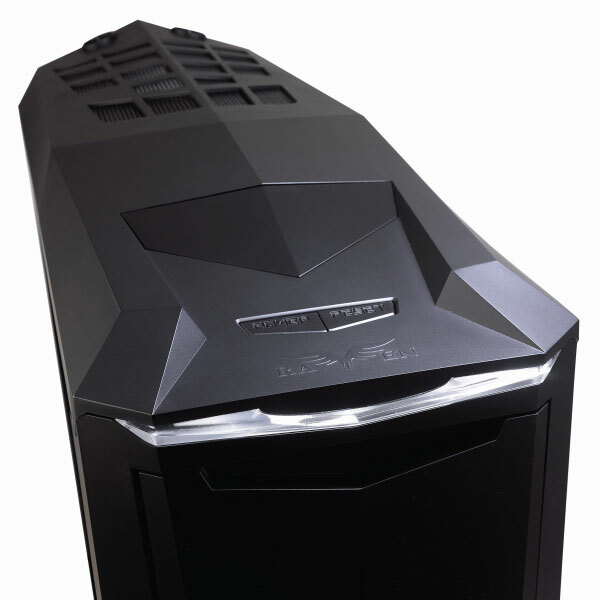 In fact, the Raven case doesn’t even look like SilverStone’s Raven mouse – there’s not a glowing plastic boil or a swathe of carbon fibre to be seen. We’ll therefore think of the Raven as birdlike for evermore. 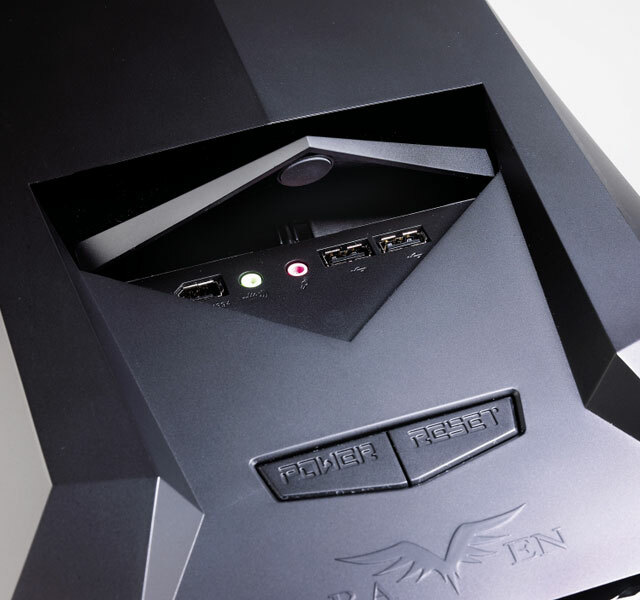 With your PC pointing towards your ceiling rather than a wall, the Raven has a sealed rear. SilverStone has taken the opportunity to sculpt the rear into something that wouldn’t look out of place on sci-fi tank. However, the lack of cable management at the rear is disappointing, as your speaker cables and DVI cable just hang out of the hole at the top. The top vent also obscures all of your I/O so if you need more than the front panel gives you (two USB 2.0, one FireWire, headphones and mic) you’ll need a USB hub for your desk or a front panel. The Raven has space for five 5.25in devices, and the front has a slide-down panel to hide them. You need to first push this panel into the case, and then press it downwards; the action never felt particularly smooth no matter how much we played with it. The slide-down plate does try to slide back up if it’s not clicked into place – we emphasize the ‘try’ as the plate jitters up upwards pathetically, with much grinding of gears. It does lock into position when fully opened, so at least the Raven won’t mangle your optical drive tray as you’re searching for a lost game disc. 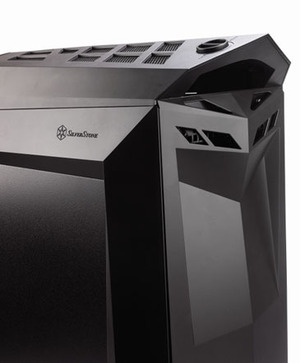 Silverstone's sturdy little Sugo SG04-H is in fact the next instalment to the company's line of portable micro ATX cases. Build quality and portability are both strong points for the SG04 but as ever certain compromises have to make when going small form factor.